Gutter systems on homes last approximately twenty years. Copper gutter systems are the most durable, sometimes lasting as long as 50 years. 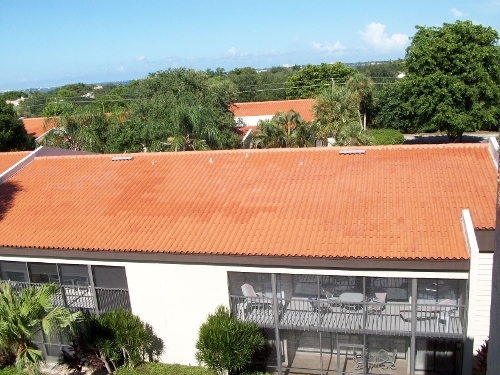 Florida weather can be especially tough on gutters, and gutter repair in Fort Myers is not uncommon. Some small repairs, like those from wind damage or carelessly placed ladders, are easy to spot. There are some ways to tell if your gutters need repair or replacing. Sagging gutters often only require a simple repair, but can cause damage to your home if left unattended. Improper water flow can cause backup, creating damage on the roofing, walls and interior of a structure. Sagging gutters should first be cleaned thoroughly. The gutters should then be propped up and have the hangers adjusted to eliminate the sags. Hiring professionals to help with gutter repair in Fort Myers will insure your gutters work properly while eliminating any dangers associated with working on a ladder. Do you frequently find screws and nails that are supposed to hold your gutters in place? Are you constantly replacing the fasteners on your gutters? These small signs could indicate that you may need to replace your gutters or the fascia on your home or business. An Experienced roofing contractor will help you determine what repairs might be necessary. If your gutters are lightly damaged with a few small holes, they could be fixed with flashing and sealant. If your gutter system has persistent large holes, they may have reached the end of their lifespan. Holes will often increase in size and quantity once they begin to appear. A number of cracks, large holes or rust spots could be a sign that the gutters should be replaced instead of repaired. Gutters that need repair or replacing can cause extensive damage to a building from its foundation to its roof. Do not ignore the signs if you need gutter repair in Fort Myers. Contact professionals for help determining which approach is best for your home. Your gutters are responsible for catching rainwater and small pieces of debris and carrying them away from the sensitive areas of your home, making them one of the most important parts of your homes exterior. In order to work properly, you must perform routine maintenance and gutter repair in Ft. Myers, FL. How often you should repair or replace your gutters depends on several factors. At minimum, you should have them cleaned, inspected and, if necessary, repaired once per year. However, most experts believe you should do it once in the spring and once in the fall for a total of twice per year. If you have lots of trees on your property, you should maintain them once per season to prevent clogs. When you call a company for your gutter repair in Ft. Myers, FL, the companies technicians will begin by removing all debris that has gathered and clogged the gutters. From there, they will use handheld blowers or wet/dry vacs to remove anything that was too stubborn to come out on its own. Next, they will check for and repair any small holes or leaks, replacing any severely damaged areas along the way. Finally, your repair company will install screen guards to help protect your gutters. If you have an aluminum gutter system and perform routine maintenance and inspects as you should, it could last for years or even decades. In fact, some companies are so sure of their gutters that they offer lifetime warranties. Installing gutter guards can help to protect your gutter system. Hoods are more expensive, but help to keep even smaller pieces of debris from clogging the system. Mesh is more affordable, but be sure the screen is small enough to avoid letting in small twigs, leaves or nuts. Gutter repair in Ft. Myers, FL is an important part of home maintenance that ensures your familys safety, your homes protection and your propertyies value. Never skip this important part of home care.